What is the next section of the Bella Vista Bypass that AHTD plans to let for construction? I don't see any on the STIP for 2013-2016. 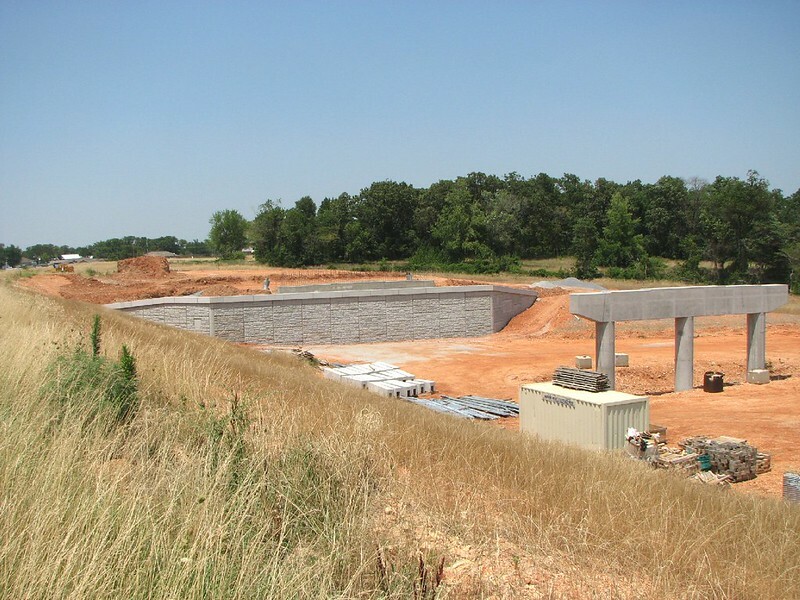 West embankment and center column of future bridge over I-49 at AR 72 southeast of Hiwasse. Nice to see some progress... As much as I hate AHTD. I just hope they don't f*&^ it up like they did with I-540 in NWA... Meh, too late. US71, do you feel these will be frontage roads? I don't see that. There were 2 articles in the Arkansas Gazette today about promoting the state wide 1/2 cent sales tax. They have 3 projects in Northwest Arkansas area that will be on the list to get money. 1- 125 million to widening stretches of I 540 in Washington and Benton counties to 6 lanes. 2- 100 million for completion of the Bella Vista Bypass of 2 lanes. 3- 150 million to help build a 4 lane section of U.S. 412 Bypass north of Springdale. Maybe Little Rock want get all of the money if voted in. Although it said Little Rock would 300 million for a new bridge at the Arkansas river on I 30. I-30? I figured they would go for the new Broadway Bridge. I think finishing I-440 should be a priority in the Little Rock area. As others have pointed out, AHTD doesn't prioritize very well. Is the existing bridge not wide enough to handle the traffic? Or is the existing bridge falling apart? The I-30 bridge is considered substandard and is starting to age and need repairs. I think AHTD wants wider shoulders and the Corps of Engineers says the piers are too closely spaced for barge traffic. Was that bridge built before the river was "upgraded" to the McClellan-Kerr Navigation System? 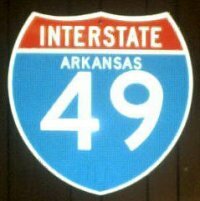 I wish you would take your I-49 shield to AHTD in Little Rock, offer to let them make copies, and then get one of them to do to the Arkansas delegation what a Texas Transportation Commissioner recently did to the Texas delegation with I-69 shields. Give them a constant reminder. I believe it was. The I-30 bridge was built circa 1960 and the Little Rock section of McClellan-Kerr project was finished around 1968. It still had to be built with navigation in mind since the plan to deepen the channel was in the works. There are two other traffic bridges and two railroad bridges between downtown LR and NLR that didn't have to be replaced (the Main Street Bridge was built in the 1970s after the navigation project was finished and I believe both railroad bridges have lifting center spans). The I-30 bridge is perfectly good other than the fact that it's barely wide enough for six lanes. Functionally obsolete. My 2 cents on AR Trans funding: It's ridiculous, and I probably sound like a broken record. I complain way too much on this forum. And I apologize for my bi*&^ing again. We see them constructing future I-49 in SW AR, and constructing more of US 67 (Interstate standards I believe) to the northeast of Newport, AR... aka low traffic counts. Common sense would tell you to have projects in areas with high traffic counts and high accident count areas? Right? Or am I crazy? Ummm... Yeah. I thought, for sure, my interchange on I-540 in NWA would see something, some sort of reconstruction, this summer... Some sort of improvement... No change... Zero. Backed up, as always. My hate for AHTD has increased, and I didn't think that was possible. Future I 49 in SW AR was earmarked I think for a 100 million by State rep. in This area. 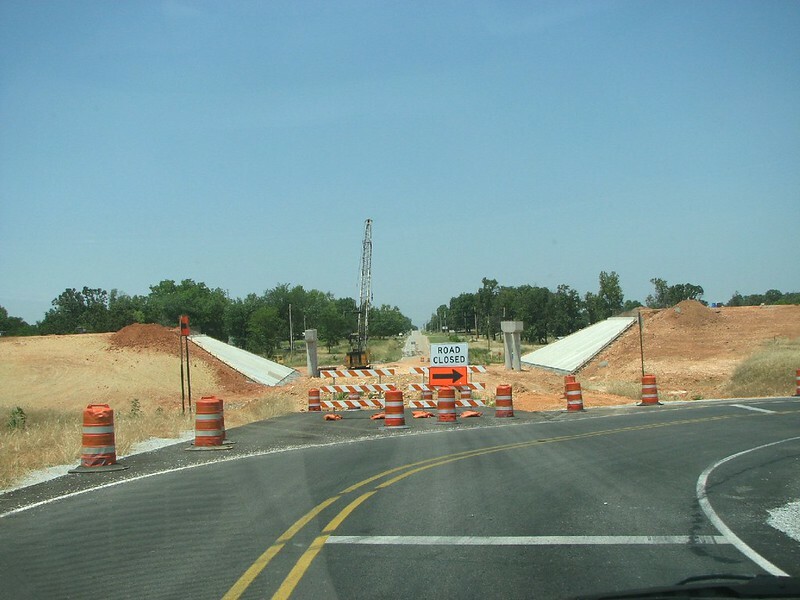 Congress has designated Future I 49 as a high priority corridor. But US 67 is a AHTD Priority and Randy Ort said in the Arkansas Gazette about a month ago that was his and some others dream to extend it to Interstate standards to ST Louis. Even though Missouri dropped there side of it. One thing you can count on is AHTD has there retirement meeting every 3 months. That is what they concentrate on. The second half of this July 15 KTBS-Shreveport TV video report focuses on the I-49 funding challenges for the Fort Smith to Texarkana section. We are completing an application to have I-540 (I-40 to Missouri State Line ) redesignated as I-49 and plan to submit to AASHTO for consideration at the fall meeting. The Special Committee on Route Numbering meets on November 15. AHTD still has a chance to get I-49 shields facing the highway before MoDOT. Game on? edit - Or, will AHTD coordinate with MoDOT this December, and then coordinate with LaDOTD in Summer 2013 for SW Arkansas and I-49 North segments? This is roughly halfway between I-540 at Ft Smith and Jct 10 Spur near Greenwood. That's the "Chaffee Crossing" segment; it's been under construction for several years. The Arkansas River crossing to the north is on hold. The section in yellow is a new segment (less than 6 months old). If nothing else, it could be a "bypass" between 71 and AR 22 at Barling. The state Highway and Transportation Department plans to award a contract next year to build a fourth interchange in the Fort Smith area for the long-planned Interstate 49. Three other Fort Smith-area interchanges for the new northsouth interstate are nearly finished, according to Shipman. THE PURPOSE OF THIS PROJECT IS TO CONSTRUCT 0.635 MILE OF THE HWY. 71 RELOCATED EMBANKMENT, THE EMBANKMENTS FOR THE RAMPS ALONG WITH THE OVERPASS BRIDGE AND APPROACHES AT THE INTERCHANGE OF HWY. 71 AND COUNTY ROAD 8 IN SEBASTIAN COUNTY NEAR THE FORT CHAFFEE MILITARY RESERVATION. THIS PROJECT CONSISTS OF EARTHWORK, AGGREGATE BASE COURSE, ACHM BINDER AND SURFACE COURSES, MINOR DRAINAGE STRUCTURES, GUARDRAIL, EROSION CONTROL ITEMS, A CONT. COMP. PLATE GIRDER UNIT OVERPASS BRIDGE (329.16 FT.), WIRE FENCE, MAINTENANCE OF TRAFFIC AND MISC. ITEMS. The section in yellow is a new segment (less than 6 months old). Given the time frame and the length of the yellow line, it looks like the "fourth interchange" project. In today's Arkansas Democrat Gazette was an Article about the Bella Vista Bypass. The first segment is about 50% complete and the 2nd segment started in June. Both are scheduled to be complete in 2014. There is no money earmarked to do another section unless the sale tax amendment is passed in November. If it does pass they will finish 2 lanes of the Bypass and also widen some I 540 from Fayetteville to Bentonville. Also one section of the Springdale Bypass will be built. Otherwise there is no section for construction to be built until 2016. There is no named opposition so far for the amendment as of now. Yes, quite likely. CR 8 is Howard Hill Rd, which is just SW of where the last project ended (Rye Hill Rd). Judging from the grading, I would say the dirt work will probably end just before 71. Lots of traffic in the area, so there really isn't a good place to stop for actual photos. I enjoyed watching that video as well as the I-49 Road To The Future segments.